I use a coffee grinder to grind mine and put it in my protein shake. It’s fast, easy, and tastes great in the shake. I use Arrowhead Mills steel cut oats. I add a little cinnamon and a little sea salt. I love this oatmeal! I Herb has a great Irish Steel Cut Oats. They cook quickly and taste awesome. I used to buy it and get it delivered when I lived in Korea. I use my rice cooker with rolled oats, throw in some cinnamon with it. The trick is to throw it all away and go buy a steak. Steel cut (3 cups water, 1 cup oats), chopped walnuts to taste, three dates chopped, cinnamon, pumpkin pie spice, dash of vanilla. Bring to a boil and simmer for 15 minutes or bring to a boil and let it sit overnight. The key is actually to slow cook it over a stove, constantly stirring. Using milk. And you stop right before it looks done, because when you rest it then it actually finishes. It’s an art. Bob’s Gluten Free … mix uncooked with cottage cheese, cinnamon, apple or pumpkin butter, and pecans. Mighty delicious! A quick recipe is to use plain oatmeal (can be instant or normal). Put a half tbsp of peanut butter in there before you put the water in, stir it in and microwave it for a minute. Then put some chocolate/rocky road protein powder over it (tsp-tbsp ish) and stir it all again. Tastes like a Reeses Peanut Butter Cup. Obviously everything will have to be multiplied for how much oatmeal you’re using. I do mine with blender. I use herbalife protein powder any flavor 2 scoops and add 3 scoops of oatmeal, add half banana and 5 cubes of ice. You can add 1 tsp peanut butter and 250-300 ml of water. I put bananas and a squirt of honey in my oats! Boil water with some bananas, cinnamon and a little honey. Sometimes I’ll just use berries but bananas taste best. I normally let it sit for about 10 mins so the banana has time to flavor the water. Then I stir in the oats (I normally use the Trader Joes brand). Once the oats are in and it’s nice and thick I let it sit for a while(covered). I’ve done the same thing with steel cut oats. All the flavor of the fruit/cinnamon and honey sink into the oats if you let it sit for 10-20 minutes, worth the wait! Steel Cut Oats in Crock Pot with Cinnamon. Mmmm. I mix cream of rice and any instant oatmeal packs together with Splenda and sugar free chocolate sauce!!!!! Wheat germ, mailed flax seed, Greek yogurt, protein, blueberries, strawberries. Steel cut is the bomb! We make it by the batch. Scoop out, add some almond milk and cinnamon and warm up. Raw oats with coconut milk, sliced almonds and berries. Half a teaspoon of agave for flavor. 1 cup old Fashioned Oats or Steel cut, 2 1/2c water ( I like it soupy),cook. Add 1/2 c nuts, 1/2 c blueberries, 1/2 c peaches, 1/2 c pears, real Maple syrup to taste. Very yummy, you can add any fruit! As an FYI Whole Foods often has some pretty good premade oatmeal although sometimes it is too soupy for my taste (each store seems to make it differently). Soak the raw oat groats overnight, then rinse and drain well. Blend all the ingredients together in a food processor (chunkier) or a high-speed blender (smoother and creamier). In a medium bowl, mash the banana until mostly smooth. Stir in chia seeds followed by the protein powder (if using) and oats. It will resemble a very thick paste. Whisk in the water/almond milk with a fork, until smooth and no clumps remain. Place in the fridge overnight or for at least 1-2 hours, until the oats are soft and the mixture is thick. Serve with a sprinkle of granola and fresh fruit, if desired. Thanks to all who contributed and shared your ideas. So which one is my favorite? I actually came up with my own. I was switching up my standard breakfast and it needed to meet the following criteria: I had to be able to make it in my office (just a microwave), I had to be able to cook it in 10 minutes or less, it had to taste good, and it couldn’t require much clean up. I take a microwave safe paper plate (don’t get the uber cheap kind, get a thicker one) and fill up a third of the way with water (I like mine pretty thick, add more water if you like it soupy). Heat in the microwave for 1:30. 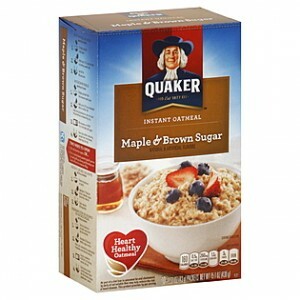 Take it out and add in 2 packets of oatmeal, I use Quaker Instant with Maple and Brown Sugar. Stir in the oatmeal. That alone was adequate but I never found myself enjoying it. Now I add in a handful of Michelle’s Homemade Granola (available at Whole Foods), 2 pinch-fulls of slivered almonds, and then a fruit of your choice if available (blueberries are great). If you don’t have access to straight granola you can even use ½ of a granola bar in a pinch. Stir it all up again and let sit for 2-5 minutes. There you go. You can make (and eat it) all in 10 minutes with no prep. This is a very cheap meal if you are concerned with cost and for clean-up you just toss the paper plate and plastic spoon (you can follow the same guidelines with a real bowl at home of course). I have been eating this for almost a month straight and am happy with how it tastes, my energy levels, and the changes to my body composition. If you wanted to eat less of course you could just half the ingredients. 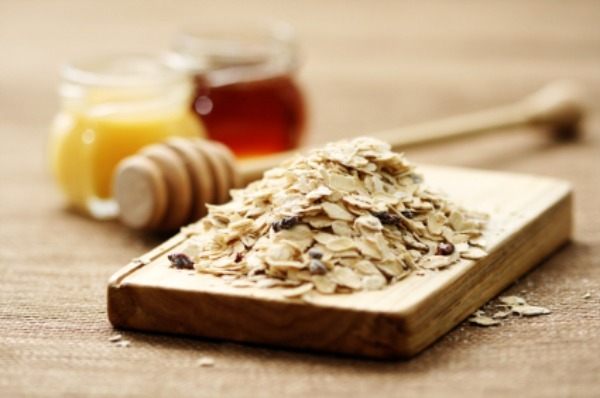 Do you have your own ideas about the best way to cook and make oatmeal? If so share in the comments below. Thanks for sharing about oatmeal. It’s good for health. A more nutritious foods.